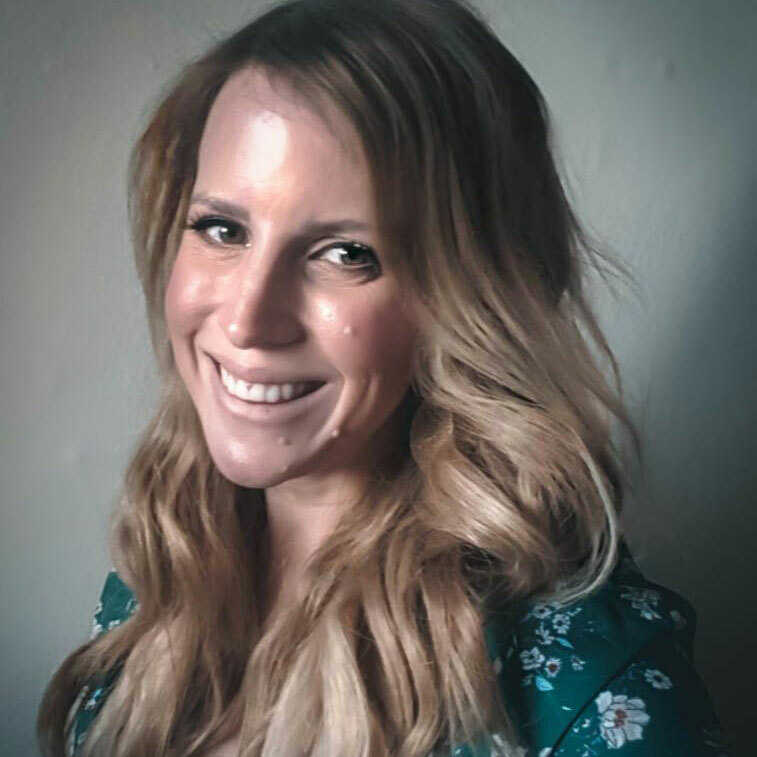 I can understand this completely as, whilst baking is (and always will be) a popular family activity, many parents are starting to move away from using artificial flavours and colourings. When it comes to flavourings, I always have a bottle of good quality vanilla extract squirrelled away in the baking cupboard at home. You could also use fresh vanilla pods, but they’re quite pricey and you don’t get as much for your money as a bottle of extract. Please note, extract and essence are two very different products, so do check the label if you are concerned about keeping things natural. Natural food colourings are simple to make and will keep for up to 6 weeks when refrigerated. All the ingredients used are very mild in flavour, so you need not worry about serving up spinach flavoured cupcakes or beetroot pavlova! If you’re using the colourings in buttercream or icing, then the sugar and butter will overpower the flavour of the dye anyway. Here are my favourite recipes for natural liquid dyes that you can whip up at home with ease. Pink: A splash of beetroot juice will create a pale/medium pink shade without altering flavour. For a more intense colour, blitz together 60g cooked beetroot with 115ml beetroot juice. Pass through a sieve and bottle up the liquid. Yellow: whisk together 1 teaspoon of turmeric with 115ml water. Gently heat for 3 minutes, stirring continuously. Leave to cool completely before using. Purple: Blitz together 115g blueberries with 90g water. Pass through a sieve and bottle up the liquid. Green: Simmer 30g fresh spinach in 115ml water for 3 minutes. Blitz together in a food processor before passing through a sieve and bottling up the liquid. Blue: Simmer 180g shredded red cabbage with 350ml water for 5 minutes. Remove from the heat and leave to steep for 15 minutes. Pass the mixture through a sieve and add the liquid back to the pan. Continue to heat until the liquid has thickened and reduced. Add a small pinch of baking soda and stir until the mixture turns from purple to blue. Remove from the heat and bottle up immediately. I use the same base recipes for all my child friendly cakes because they’re quick, easy, and never fail. 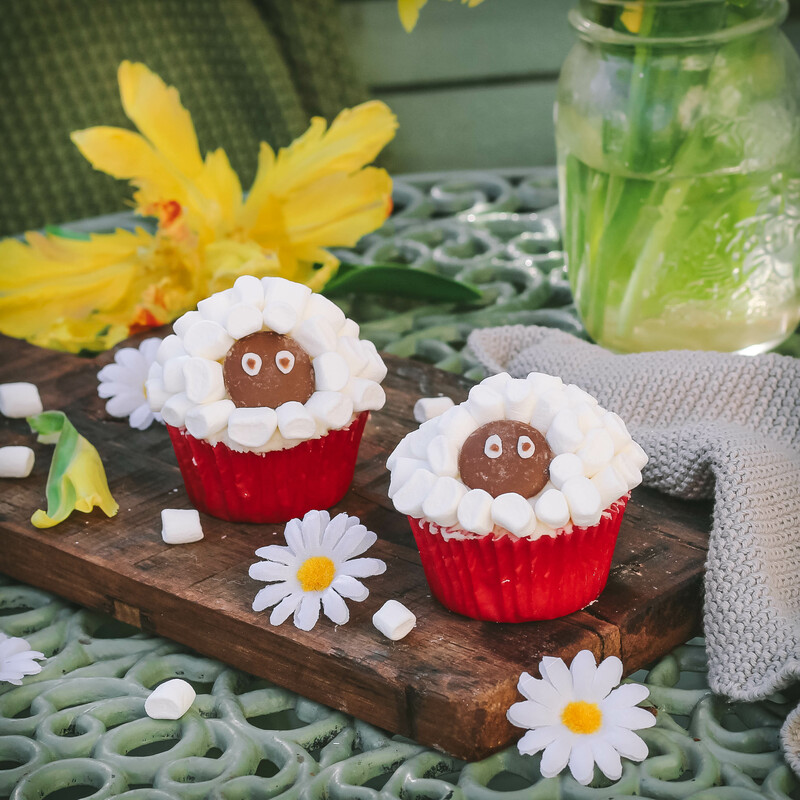 I’ve also put together some fun, family friendly spring baking projects that do not use any artificial flavours or colours and should certainly keep little hands occupied during the Easter holidays. You just need one batch of cupcakes, one batch of frosting, a couple of extra ingredients are you’re good to go. 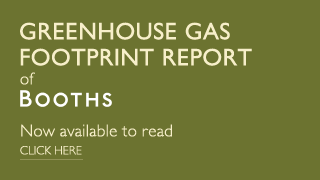 Preheat the oven to 160C/140C (fan)/gas mark 3. Line a cupcake tin with 12 paper cases. Whisk together the caster sugar and margarine until light and fluffy. Add the flour and eggs, stirring until well combined. Split the mixture between the 12 cupcake cases. Bake in the oven for 20-23 minutes, or until a skewer inserted into the centre comes out clean. Leave to cool completely before decorating. Combine all the ingredients in a large bowl and whisk until smooth and creamy. If the buttercream is too stiff, add more milk a little at a time until you’ve reached the desired consistency. Spread an even layer of buttercream over the top of each cupcake. Add a nice big dollop of buttercream to the centre of every cake. Stick one large chocolate button to the front of each buttercream dollop. Melt the white chocolate by heating it in the microwave for very short spurts, stirring inbetween blasts. Using a piping bag or a paint brush, use the white chocolate to pipe/paint two eyes on each chocolate button. Repeat the process with the milk chocolate to add the pupils. Give Sammy a big, fluffy coat by covering the buttercream with mini marshmallows. Store in an airtight container and enjoy within 5 days. Whisk together the buttercream and turmeric dye to create a yellow, fluffy frosting. Spread an even layer over the top of each cupcake. Pop the remaining frosting in a piping bag (if you don’t have a piping bag to hand, a clean sandwich bag with the corner snipped off will work just fine). Pipe a pair of wings and tuft of feathers on each cake. Finely chop the chocolate buttons. Use the shards of chocolate to create eyes and eyelashes. Cut 12 small diamonds for beaks and 24 little feet out of the melon. 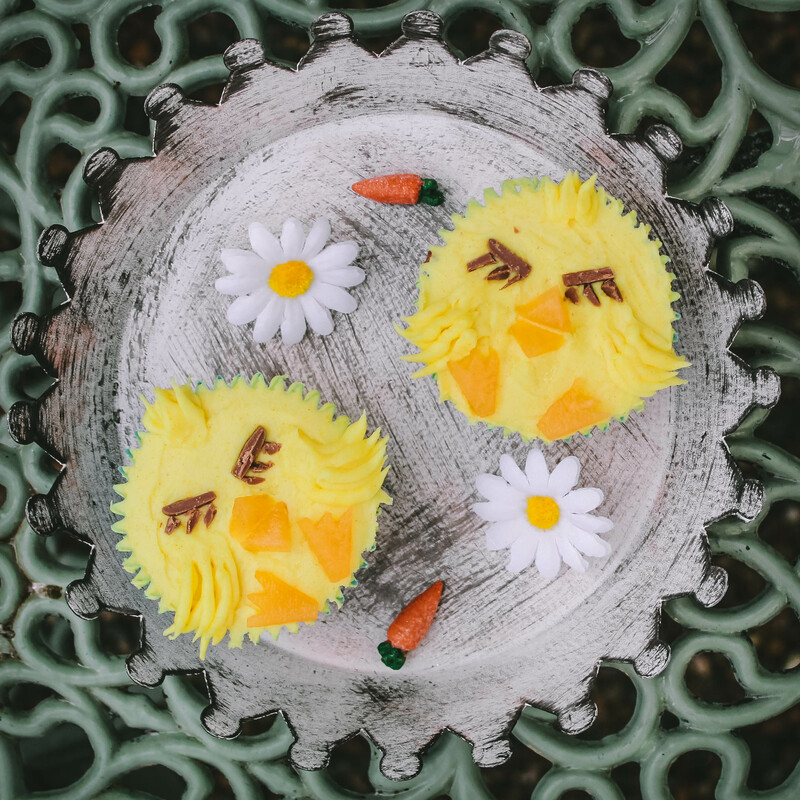 Pop them on top of the cupcakes to finish your dozen chirpy chicks. Transfer the buttercream frosting into a piping bag fitted with a star nozzle. If you don’t have a nozzle to hand, just snip a v shape out of the end of a piping bag. Cover each cupcake in fluffy tufts of buttercream. Pour the beetroot juice into a small bowl. Add one third of the ready to roll icing and knead it into the juice until it turns soft pink. If the icing becomes too sticky to work with, dust your hands with a little icing sugar. Split the remaining white icing into 24 pieces. Hand roll each one into a large tear drop shape to create the ears. Repeat the process with the pink icing. Use a little water to stick the pink pieces on to the ears. 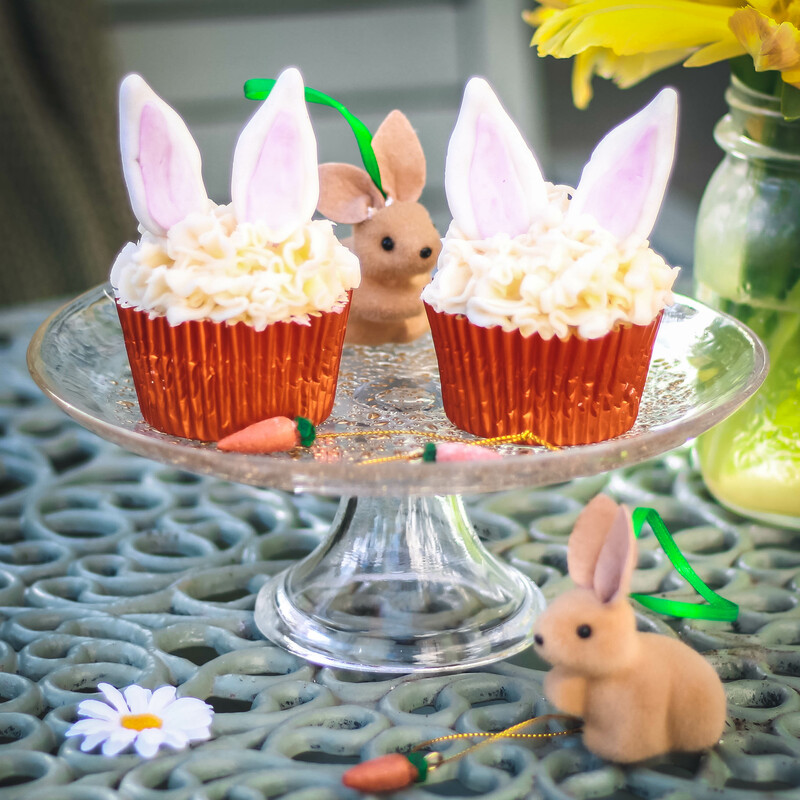 Leave the ears to set before sticking them on top of the cupcakes. However, if you’re in a hurry, a toothpick inserted in each ear would keep them upright and allow you to finish the cupcakes instantly. Spoon a dollop of buttercream on top of each cupcake. Use a pallet knife to smooth it down into a mound. Stir together the coconut and the matcha powder. Dunk the cupcakes into the coconut to create a layer of moss. 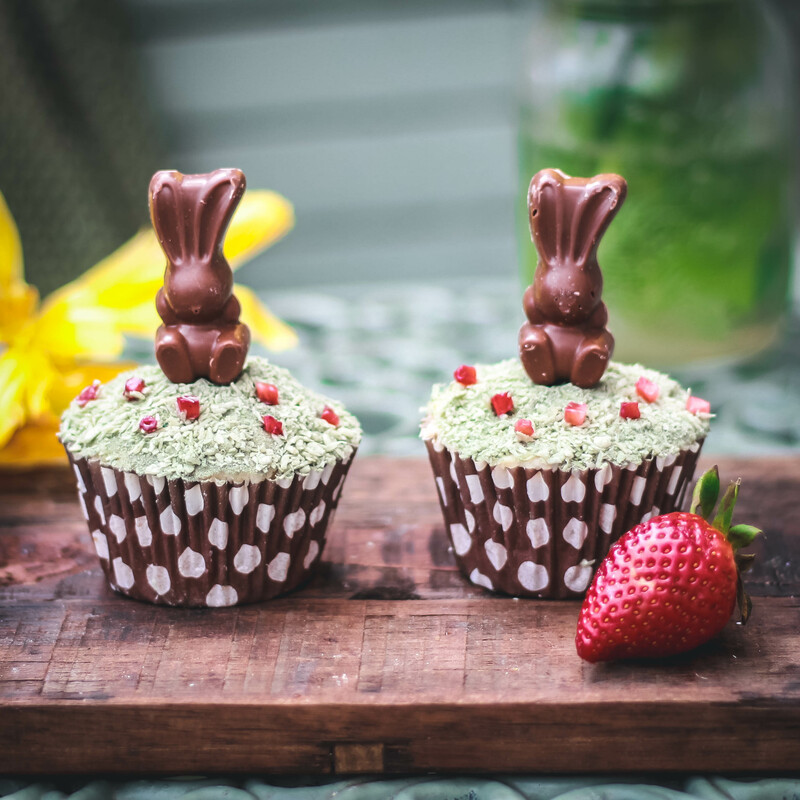 Top each cupcake with a chocolate bunny and scatter with some chopped strawberries. Distribute the cake batter between the 8 ice cream cones. Bake in the oven for 30 minutes at 160C/140C (fan)/ gas mark 3. Leave to cool on a wire rack. Puree the strawberries in a food processor or blender. If you don’t have either, mash them up as much as possible using a fork. Strain the puree through a sieve, using a spoon to really push it through the mesh. Heat the puree in a saucepan over a medium heat, stirring continuously. Continue to heat until the puree has reduced into a dark, thick syrup. 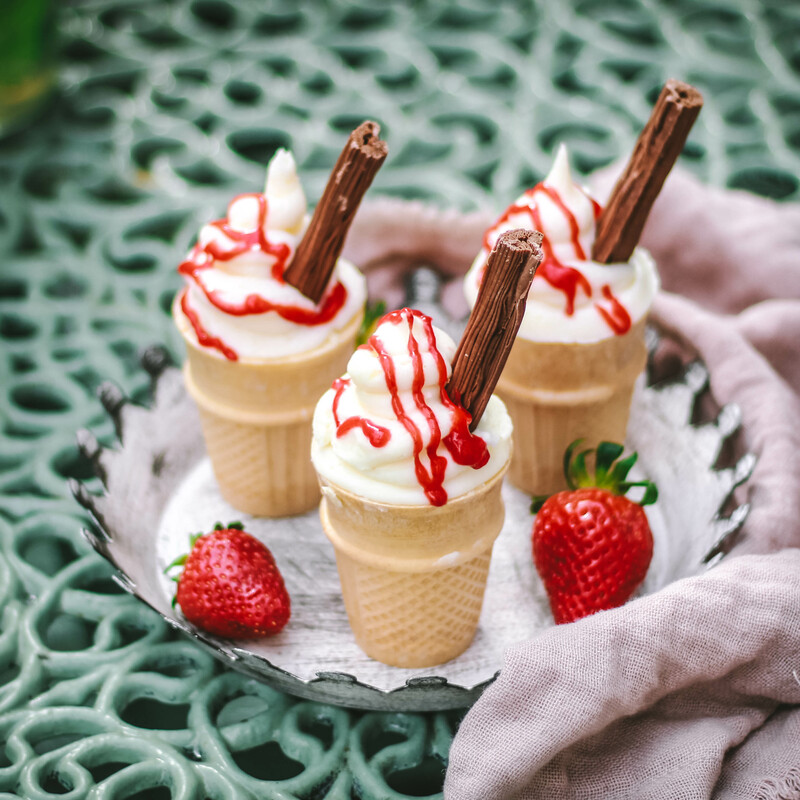 To assemble, pipe a large swirl of buttercream on top of each cone before adding a chocolate flake and a drizzle of strawberry syrup. 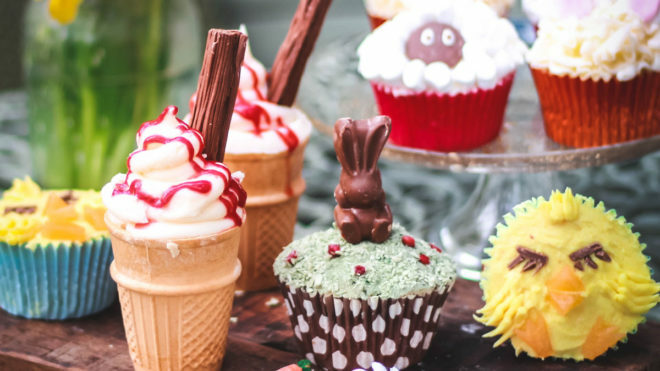 I hope these recipes help keep your little ones occupied over the Easter break. You could also make a batch or two in lieu of Easter eggs, just pop them in a box with a little shredded tissue paper, wrap with cellophane and finish with a pretty bow. If you’re after a more advanced baking project that is still artificial colour/flavouring free, you can find the recipe for my strawberry and vanilla cheesecake in the Booths spring magazine or online at by tapping here. 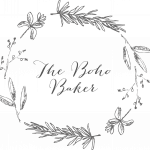 Who is The Boho Baker?